Universes of science fiction are filled with vehicles ranging from the mundane to the exotic. A starport on a world far beyond the frontier may see a mix of pedal-powered rickshaws, horse-drawn wagons and anti-grav skimmers. A high-tech centralised and industrial world will have skies filled with the anti-grav equivalent of cars, trucks and buses, while its military will be able to deploy armoured tanks who can withstand bombardment from spacecraft in orbit above them. All of these, and many more, can be created with the Vehicle Handbook. The Vehicle Handbook has been designed to be quick and easy to use, whether your Travellers are looking to quickly upgrade or modify their humble air/raft, or construct a massive battle-ready walker armed with city-crushing weaponry from scratch. Even a large, multi-turreted super-heavy battle tank will not take much longer than five minutes' work. 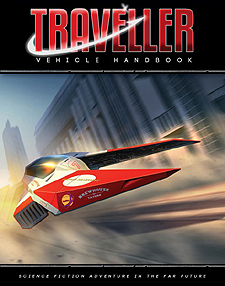 The Vehicle Handbook comes complete with an immense catalogue filled with vehicles built using this system, allowing you to dive straight in and begin populating your worlds with vehicles the Travellers can ride, purchase and fight against.